Now in its tenth year, Express is one of the UK’s industry leaders, servicing the full process - from manufacture to installation - of British ready-made and bespoke aluminium products including bi-folding doors, sliding doors, windows, glazed roofs, sky-lights, glass rooms and glass structures. From relatively simple projects to large-scale, prestigious developments, Express services customer requirements nationwide. The company has built such a strong reputation that its products and services have been featured in several television programmes, including Channel Four’s ‘Double Your House for Half the Money’, ‘The Home Show’ and ‘Grand Designs’, and Channel Five’s ‘I Own Britain’s Best Home.’ Express was started in 2007 by Steve Bromberg and his father, who spotted the emerging trend of bi-folding doors, and a gap in the market for quality UK-manufactured products created quickly. Express is family owned and managed, and it manufactures all its products in the UK as well as offering an installation service - a rare attribute in the market. In 2016 Express launched Express For Trade , a dedicated branch of the business that is designed solely for trade professionals, with two separate offerings: Trade Partners and Express Accreditation. Visit expressfortrade.co.uk to sign up and start reaping the benefits. 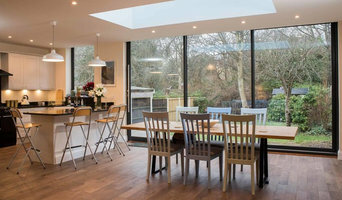 The Caulfield Company UK specialises in Top Quality Window, Wintergardens, Bi Folding Doors and Glazing Solutions. We are the UK's leading most comprehensive Partners for Intenorm Windows and Doors, alongside Solarlux Bi Folding Doors and Wintergardens. We pride our business on Passiv Haus Standards in most of our Products. Internorm is Europe's largest window brand and distributes his high quality products. The products are 100% "made in Austria". Internorm expands this leading market position every year. All Made to Passiv Haus Standards. The success story of the company began 81 years ago, and then the creation of Internorm over 45 years ago set a shining milestone in place. Trust in the brand has been shown millions of times over by sales in Europe, which up to now have exceeded more than 20 million units. This is not only hugely motivating but also commits us to accept even more responsibility. Solarlux High quality Bi Folding Doors, Wintergardens and balcony glazing. Our daily work includes manufacturing and installing our systems as well as offering our customers bespoke solutions to create new space and light to our customer`s lives. Our passion can be traced back for almost 30 years and has enabled Solarlux` development to a successful company throughout the UK and in an international environment. In order to ensure a good quality and longevity, the production as well as the development of our systems takes place solely in our company`s factories and our systems are tested and certified by renowned testing institutes. In cooperation with architects and developers, Solarlux realises exceptional design with innovative character according to high national and international standards. Alpine’s premium range of bespoke aluminium bifold doors, sliding doors, windows and roof lanterns are designed and installed to exceptional standards, offering a wide choice of styles to perfectly complement any home or commercial building. From our factory and product showroom in Leeds, the Alpine team will work with you every step of the way to create bespoke styling and an Alpine Approved quality finish that will bring your home to life. Our experienced specialists can assist you in all aspects of your project – from design aspects and finish options, through to nationwide installation and surveying services (or supply-only basis). The thermal performance of our range of architectural aluminium products far exceed the latest building regulations, thus increasing your energy efficiency and helping reduce your CO2 emissions at the same time as saving money on your energy bills. We are passionate about giving customers and clients their overall vision, and our focus as a business is on you!. We careful manufacture hand crafted aluminium windows and doors which are bespoke for each and every client, Understanding their every detail of their project and ensuring that quality not only lends itself to the project but throughout the installation process and even to our complimentary aftercare service. Our superb range of products allows the ability for one company to care and transform a home effortlessly. In addition, we have the added benefit to provide into the marketplace some fantastic Scandinavian aluclad timber doors and windows, which are carefully crafted to enhance any home which is looking for a more environmental or cost effective running home, Our select product range has the ability to enhance any home whether a 3 handled tilt and turn or a 7 metre alu-clad timber sliding door all are possible within our range. We don't employ any subcontractors whatsoever, thats why the quality of our product surpasses our competitors, by keeping this in house further enhances the quality of all our products. 60 year life expectancy on all our alu-clad timber doors and windows - which is qualified by independent research. So quality, service and aftercare is what Reveal Doors and Windows strive to achieve . Timber window renovation specialists. With over 30 years' experience, Ventrolla are the Sash window repair, draught proofing and double glazing experts. We have local, friendly teams across the country and offer a FREE, no obligation, survey and quotation. 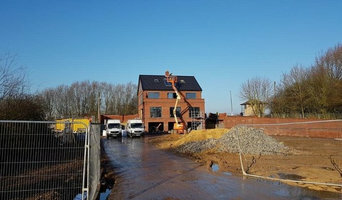 At House Of Canopies Ltd we design, manufacture and supply standard & bespoke door canopies for residential dwellings, commercial building projects & we also offer budget solutions for Social housing Projects. Our Pouducts fully comply with the Equality act (Formerly known as the Disability Discrimination Act or DDA) All Canopies are tested to ensure compliance with stress/deflections and snow loads in accordance with EN12150 and BS 5516-2. From Contemporary Glass Canopies to free standing walkway canopies, anything is possible, including a variety of finishes, including brushed 316 Stainless steel or a mild steel structure powder coated to the RAL Colour of your choice. We supply Glass, Polycarbonate or GRP Canopies and we have many stock sizes, designed for standard and double doors. We also design and manufacture canopies to any size & situation. Concept Windows and Doors Ltd provide innovative glazing solutions in UPVC, aluminium and timber. Ebor windows are in the position to provide you, the customer, with the correct product for your home. There is a wide range of Window and Door products on the market which include Engineered Timber, PVCu, Aluminium and Aluminium clad Timber, all of which are available in a wide range of colours and stains. Ebor Windows can provide all of these products and advise you which is the correct one for your home. Director, Paul Furnival, has been involved since 1980 in replacement windows and continues to bring his expertise to the demanding market for double glazing and PVCu windows in York and the surrounding areas. The UK's leading online glass partition supplier and installer for glass walls and doors, offering a nationwide service. Call now for a free consultation! Marlin Windows are a Yorkshire based company who specialise in providing high quality aluminium window and door products for both domestic and commercial applications. We have a special interest in replica refurbishment projects and work closely with architects, specifiers and conservation professionals to deliver the most aesthetically pleasing and thermally efficient glazing solutions. Operating from a modern and highly equipped engineering facility based in the heart of Yorkshire our product range and innovations have placed us at the forefront of design solutions for the listed building, period and retro refurbishment sectors across the United Kingdom. Established in Huddersfield in 1997, The Lockwood Window Company is a long standing family business specialising in the design, manufacture and installation of both a bespoke and standard range of PVCu windows, doors and conservatories, and composite doors through sister company Composite Doors Yorkshire We install into domestic, new build and commercial buildings throughout Yorkshire, and can also offer a ‘supply only’ service to both members of the public and trade. All products manufactured by The Lockwood Window Company are CE marked giving you assurance that they comply with all relevant EU legislation. The Ryburne Window Company Limited was incorporated in June 2007 - we are approaching our 10th anniversary. We’re a family firm employing 14 members of staff, the majority of whom are shareholders in our business and everyone is committed to doing a first class job. Most of our work comes from recommendation and we will go that extra mile to achieve what our customers expect, in the hope that the referral trail continues…please visit our website to read more testimonials from our customers going back many years. 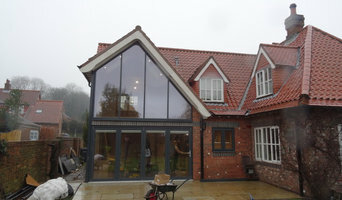 www.ryburnewindows.co.uk We offer a comprehensive range of products to suit all budgets. We manufacture the Deceuninck 2500 and 2800 HERITAGE range of windows and doors at our factory on Hanson Lane, along with the RESIDENCE 9 Timber alternative window system, Slider 24 patio and a range of Traditional Sliding Sash windows, all available in over 26 colours from stock. Double glazed sealed units are made here too, a full range of glass types are available cut to size. Our installations are completed by salaried employees – not sub-contractors and we do not employ pushy salespeople. All quotations are provided in writing and our work is guaranteed and insured for 10 years. We are registered with CERTASS and all building regulations are complied with. Please visit the factory or showroom at Hunger Hill, visit the website for detailed brochure downloads or call us free on 0800 0740854 to speak to us! We look forward to hearing from you!! What can specialist window companies, glaziers or window fitters in Leeds, West Yorkshire do for me? Specialist Leeds, West Yorkshire window companies and fitters can diagnose problems and prescribe a choice of remedies, while keeping in mind factors such as the style of your property, ease of operation, budget, noise reduction, thermal efficiency (the lower the U-value, the better), durability and maintenance. It is a balancing act that only a glaziers can deftly strike. Most Leeds, West Yorkshire window companies will be able to take care of both supplying and fitting your new or replacement windows, but if you have already purchased your windows from a window manufacturers then you can find a Leeds, West Yorkshire fitter to just take care of the installation. What type of window company should I hire? uPVC or PVCu window manufacturers will be able to assist in upgrading your windows with the latest technology. uPVC offers a cheap, energy efficient and low maintenance option. A period window specialist will have particular expertise in how to deal with period windows. For example, you may be living in a Georgian property with original sash windows that have seen better days. They need draught proofing, the window frames are showing signs of rot, the sash mechanisms aren’t working smoothly and the budget is tight. A sash window refurbishment specialist, together with his team of glaziers and joiners, can reinvigorate your period windows, help install secondary glazing, or provide authentic replacement windows. If you are looking to add windows to your roof as part of a loft conversion then you should look for window companies with knowledge of roof windows or Velux windows. They will help you select the correct number of roof windows to maximise the light in your attic space whilst maintaining affordability. Where can I find the best choice of Leeds, West Yorkshire window manufacturers and window installers? Right here on Houzz. Look for Leeds, West Yorkshire Windows & Double Glazing professionals in the Find a Pro category and then save images of window styles you love in an Ideabook. Take time to look through each window company’s profile and get a sense of where their strengths and specialisms lie. Make sure your window manufacturers’ work comes with accreditation: whether from FENSA (Fenestration Self-Assessment Scheme), FMB (Federation of Master Builders) or TrustMark. Are you registered with FENSA and a member of a trade organisation such as the FMB? How long have you been manufacturing and/or installing windows? If you just install, which window manufacturers do you tend to work with? Do you provide replacement windows for period properties? What styles do you specialise in? What level of service will you provide? What choice of materials do I have for my budget and which type of window would be your recommendation? Is that type of window CE marked? What are the WER (window energy rating) and U-value of this type of window? Do you have a showroom nearby where I can take a closer look? What is the most difficult part of this project and how will you tackle that? Who will actually be carrying out the work and are they fully qualified? Will you be using sub-contractors? Will all workers be covered by public liability insurance and employer's’ liability insurance? Is your written quote fixed and inclusive of all labour, materials and VAT? Please can we agree a start and completion date and discuss what happens if the completion is delayed? How much disruption and mess will there be? Is a deposit required and, if so, is it protected by an Insurance Backed Guarantee? Is the work covered by guarantee or warranty? Will you repair faults without charge if they occur and be on hand to provide aftercare? Who will be my main point of contact after the job is completed? Find window companies and glaziers on Houzz. Narrow your search in the Professionals section of the website to Leeds, West Yorkshire window companies. You can also look through Leeds, West Yorkshire photos by style to find new and replacement windows you like, then contact the glaziers, window manufacturers or companies who installed them.